Please, take a look at this photo. Do you find it disturbing? 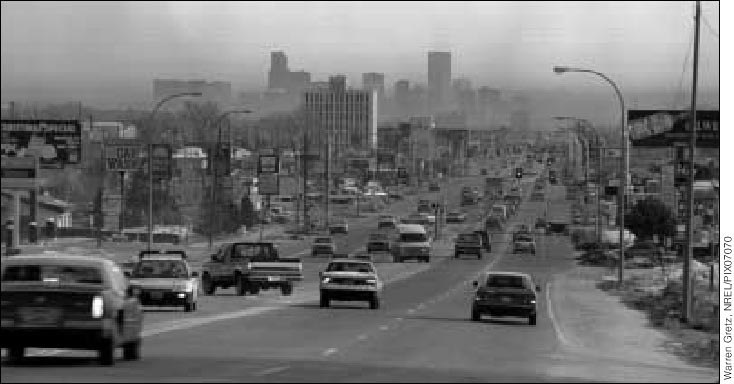 Those of us who happen to live in a large crowded city, have to breathe the air seen on the horizon here every single day. Like it or not, every time you turn ignition on, you inevitably contribute to this situation. What can you do about it? You can drive an Electric Vehicle. Why don't you visit this site? Few links for you to get some initial impression and information: this, this and this. >>> The following information was put together in about 2005 and is my personal view on the matter <<<. The auto makers and you happen to have conflict of interests. They sure can produce cars which will last longer than you want, require no expensive service and no gasoline. You want such a car, but the manufacturers want to make sure they keep getting steady income from far more profitable SUV sales, car maintenance, and the oil companies - income from the fuel sales, be it gasoline or hydrogen. EVs are so good that require none of that so you'd pay very little to nothing for your car maintenance and your personal "gas station" is as far as the nearest electrical outlet. So what do you think auto makers will sell you - what's good for you or what's good for them? They afraid of EVs, they try very hard (and unfortunately succeeding) to convince you that no one wants electric cars. They can make EVs if forced by law but at first opportunity they destroy perfectly normal EVs (sad GM's EV1 story). Hard to believe? Yes, this is unfortunate but well documented fact. Despite long waiting lists, they try to convince you there was no demand. EV1's of course were never advertised. Simple truth is, they never offered EV1's for sale to the general public precisely because they knew there was demand. If they would offer EV1's, the public would demand more, GM would be pressured to work against their business interest, so they simply decided to only lease the vehicles putting such lease conditions that very few would qualify, which is "proof" no one wanted EV1's. GM claimed EV1 could not be made because of lack of spare parts to keep it on the road... Why not make parts then? Every vehicle GM ever made has enough parts. Not EV1. Can you buy EV1 or RAV4? How about Ford's Think City or Ranger? No. GM scrapped its EV program, and despite long waiting lists, kept telling "there is no demand" while never allowing anyone to buy a single EV1 vehicle and destroying them at the end of lease. If you want to know more about it get "who killed the electric car" movie. You'd think GM could sell EV1 they leased for $25k each and make some money - certainly more than when cars were shredded and GM got nothing? It would be smart and show good will, but the problem is Wagoner makes this much in one hour so why should he care about you wanting something like EV1? Now Wagoner is asking for bailout money. Well, guess where this money will end up and when was last time *amount* changed someone's mentality? EV technology exist today. Far less complex, electric cars would cost less than gas ones if produced in the same quantities. You can compare the costs of ownership of ICE vs. EV. A word about fuel cell (FC) vehicles, namely ones using hydrogen as an energy source. Don't hold your breath to see them any time soon if ever. A FC vehicle is no doubt a step in right direction in a sense that inefficient internal combustion engine is replaced with an electric motor. The only difference between pure battery EV (BEV) and FCEV car is the energy source; the drive systems and control electronics are almost identical, so FCEV *is* an electric vehicle. However, instead of just a plain rechargeable battery, FCEV has to carry a very complex hydrogen reformer using exotic expensive materials, full of pumps, blowers, hoses, and a tank of liquefied or compressed hydrogen you need to keep putting in. Or just a tank that has been fueled somewhere else. Fuel cell manufacturers claim that FCs are quiet, since contain no moving parts. Did you have a chance to stay next to a working fuel cell vehicle? I did. A FC itself is sure quiet, but all necessary supporting equipment (blowers and pumps) make far more noise than modern ICE engine. 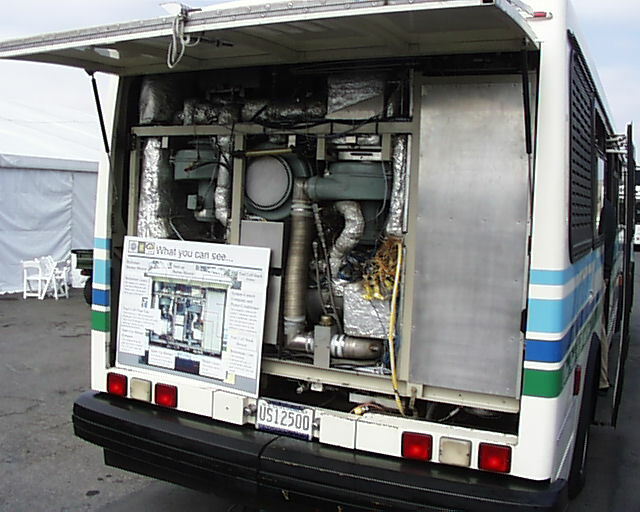 Here is an example of "quiet" FC equipped city bus demonstrated at Michelin challenge Bibendum event in California in 2003. A FC car will have scaled down version of all these components. When it runs, you can't keep a conversation unless move 50 feet away. Auto makers say fuel cell cars are clean an environmentally friendly. But so are EVs, which are even cleaner, considering charging from solar, hydro or wind sources. Auto makers sure are pro environment as long as corporate profits are not compromised. As long as you keep buying fuel and keep servicing overly complex vehicles. Doesn't matter what type of fuel, as long as business in charge is in control of your pocket, it's happy. Are you happy too? Have you questioned anyone how much energy is needed to produce a hydrogen for a FC you're going to pay for? You need electricity to run the equipment reforming hydrogen to the useable for FC form. And then, the hydrogen is going to be used to get back electricity to run a vehicle propulsion motor. What's wrong with this picture? Isn't it simpler, cheaper, more efficient and just plain makes more sense to store electricity directly in a car's battery in a first place?? Fact is, if you choose to make hydrogen for your fuel cell car and use electricity to do it, an EV using that electricity directly (stored in on-board batteries) will go at least twice as far. But no one is going to tell you voluntarily. Many advocates of hydrogen economy say, "But we can figure out a way to make hydrogen more efficiently if we throw big research dollars at the problem." Unfortunately, there are only so many hydrogen atoms in each methane molecule. Also, until we unlock the secret of photosynthesis, there will be no efficient way to make hydrogen. Batteries will always be more efficient at storing electricity than hydrogen gas. Think of all the money we have spent on fusion power and it will give you just a peek of how much we would have to spend on electrolysis to make it more efficient. There are many many other areas in alternative fuels that will reap greater rewards on a faster timetable for far less money. (Like biodiesel) Granted, no oil company wouldn't really like that, would it? Why US Prius has pure EV mode disabled while in Europe and Japan it is available? In short, money. Of course, clever people figured out how to restore EV mode in US Prius'es, but the point is, it was not removed to benefit YOU. It is removed to get read of Toyota competition by legal means claiming that superior combined fuel economy of Prius with EV mode (which thus earns big tax breaks) is unfair competition, so instead of innovating similar, corporations get rid of inconvenient innovations by legal means. Suing Toyota for too efficient cars. So Toyota backs off and removes EV mode, making cars worse, but avoids legal hassles by competing "fairly" (e.g. degrading to the same old technology as US automakers have). So let me ask you, who wins? Finally, please read this independent report to be better informed about reality. Can an EV run far? Well, if an EV could run more than 340 miles on a single charge 10 years ago, you'd think that today technology can be only better, especially if part of the money going into FC research would be spent advancing EV batteries. Can it run fast? Is about 300 mph fast enough for you? Can it be quick? How does 0-60 mph in 3.6 seconds sound? Can you own an electric car for every day use? Yes! If you're fed up with Big three, motivated enough and have a handy man skills or can get help, you can convert a conventional vehicle to an EV yourself. Or you can buy a conversion made by other EVers. Thousands have done it. You too can make a difference. If you are thinking about doing EV conversion yourself, I'll show you how I did it.